The Los Angeles Rams have decided to rest a majority of their starters against the San Francisco 49ers, after clinching the NFC West division title in week 16. It's going to be a starless night sky at the L.A. Memorial Coliseum on New Year's Eve. The Los Angeles Rams have locked up their first NFC West division title since 2003, and have guaranteed themselves a first-round home playoff game next week (Jan. 6 or 7). The Rams are unable to earn a first round bye (by virtue of Vikings tiebreaker) by beating the San Francisco 49ers on Sunday, so with either the 3rd or 4th seed guaranteed, the team has decided to rest their starters for the final game of the regular season. "For us, everything that we do is intentional and designed to try to be best for our team and our players," said head coach Sean McVay in his media availability on Wednesday afternoon. "I think they understand that. I know sometimes people might not always agree, but when situations like this come up, we talk about it's a nice luxury to be able to have. We feel that this is the best approach for us." Among the rested starters for the final game of the regular season are linebacker Alec Ogletree, defensive tackle Aaron Donald, quarterback Jared Goff, running back Todd Gurley, center John Sullivan, offensive tackle Andrew Whitworth, and linebacker Connor Barwin. Offensive lineman Rodger Saffold is also expected to sit out the contest as he nurses an oblique injury, and wide receiver Cooper Kupp could miss the contest with a knee injury. #LARams HC Sean McVay said RB Todd Gurley, QB Jared Goff, LB Alec Ogletree and DT Aaron Donald will all rest on Sunday. Wouldn't be surprised to see Cooper Kupp, Connor Barwin, John Sullivan, Rodger Saffold and Andrew Whitworth rest as well. The decision to rest players when there's nothing to play for in the final game of the season is one that has long haunted teams and coaches in the NFL. There's no right or wrong answer, either. Some teams rest their starters, some teams play them for the entirety of the game. Others, like the New England Patriots, treat the game like a preseason game, opting to play starters for the first half or first quarter before inserting their backups. For example, the Jacksonville Jaguars are in a similar situation as the Rams. They have clinched the AFC South division, and the no. 3 overall seed in the AFC playoffs. Despite nothing to play for, Jaguars coach Doug Marrone has chosen to play all his starters and play to win against the Tennessee Titans on Sunday (something the Chargers are thankful for). In the case of Gurley, the week off could hinder his MVP bid as the running back could have added to his case, following his back-to-back breakout performances in Week 15 and 16, respectively. Gurley became the third player in NFL history with over 2,000 yards from scrimmage, 10 or more rushing touchdowns and six or more receiving touchdowns in a single season, joining former Ram Marshall Faulk and O.J. Simpson. NBC LA Sports Reporter Michael J. Duarte interviews Los Angeles Rams rookie defensive tackle, Tanzel Smart, about playing alongside Aaron Donald, growing up in Baton Rouge, and what he wants to do after his playing career is done. 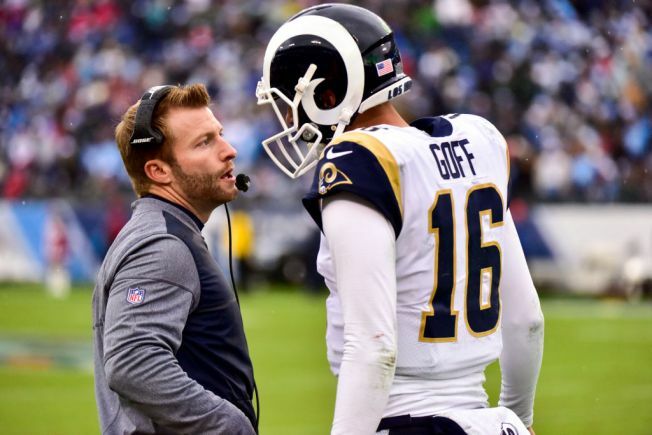 However, as coach McVay mentioned, Gurley and Goff's production could be limited anyways, especially if three starters on the offensive line don't suit up for the game as expected. Sean Mannion will start at quarterback for the Rams on Sunday, with Goff dressed and serving as the backup in an emergency. The resting Rams give 49ers QB Jimmy Garoppolo the opportunity to improve to 5-0 on the season as the starting quarterback in San Francisco, and 7-0 overall to start his NFL career.